I lived in a household that my mom cooked all the time. We served meals to guest often around our dinner table. The dinner tables were even decorated beautifully for each season. But one thing I never learned from my mom was how to set a table properly for dinner. I had a general idea of how to set the table, but it was more of getting everyone a plate, glass, knife, fork and sometimes a spoon. How to set a table properly for dinner was just not an important lesson that my mom thought she needed to teach me. 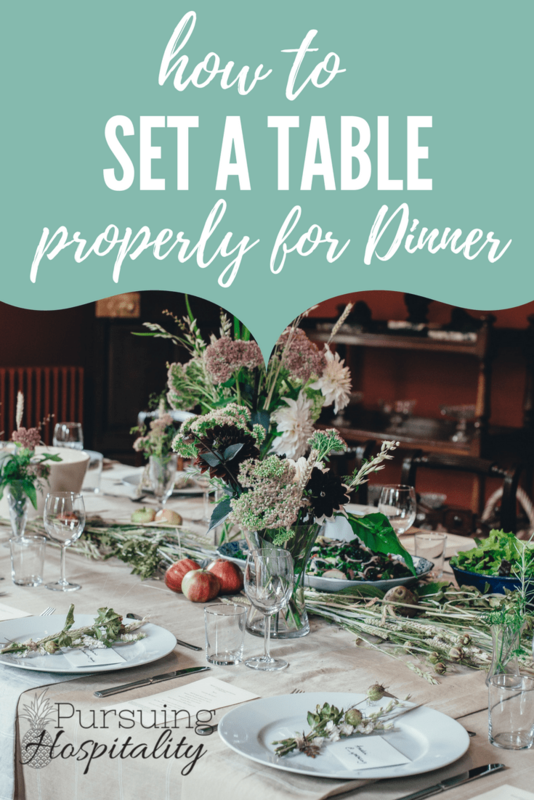 I learned by reading a book by Dorthy Patterson called, A Handbook for Minister’s Wives, how to properly set a dinner table. Mrs. Patterson is the wife of the President of Southwestern Theological Seminary and entertains often. She is little more formal and proper than I am but her approach and logic is spot on. Let me share with you what I have learned. Dinner plate in the center of setting. Add flatware. When setting your flatware out, remember you will begin from the outside and work yourself toward the plate. On the Right: The knife is on the right next to the plate with the blade facing the plate. The right of the knife is the teaspoon for coffee or tea service at the end of the meal. The soup spoon is to the far right since soup is usually one of the first courses. On the left, the dinner fork is closest to the plate, to the left of the dinner fork is the salad fork. Top of the Plate: The dessert fork and spoon are at the top of the plate. The dessert spoon handle facing right. Dessert fork facing left. 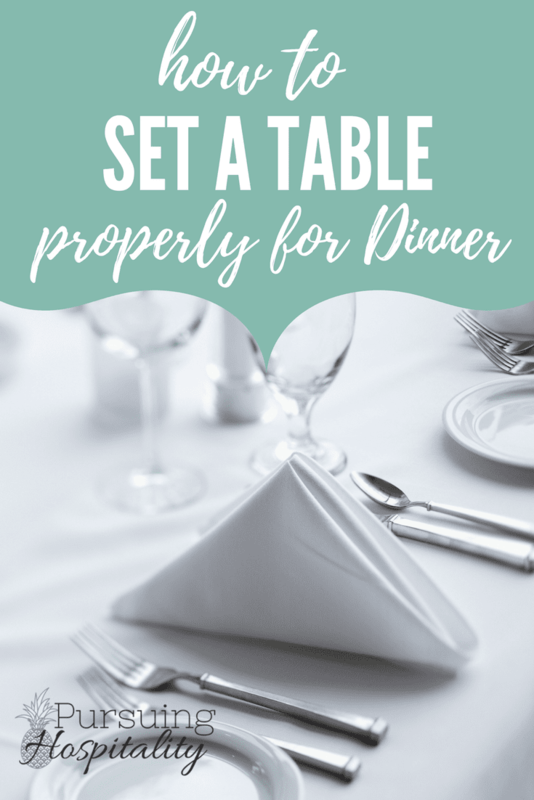 Place the napkin to the far left with the fold away from the plate unless you put it on the plate or in a glass. The salad plate goes to the far left of the forks and napkin. The bread plate goes above the forks. Place the butter knife on the bread plate with the handle on the right and the blade facing in, laying across the plate. Place the water glass above the knife and the optional tea glass is to the right of the water glass. The cup and saucer are to the right of the spoons. The handle should be in the 3 o’clock position for a smooth line on the table. I love the thought of having my table set properly. I think when you are preparing a meal for a guest, the table is the finishing touch. 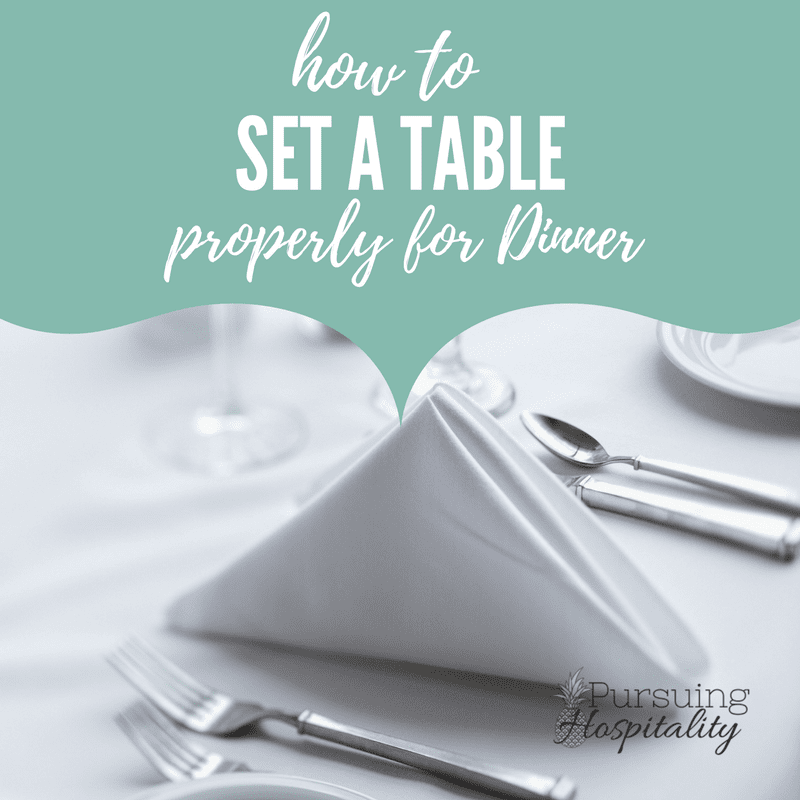 Setting your table is a way to tell your guest that they were thought of before they arrived and you prepared for their visit by making a spot for them at the table. This will make your guest fill loved.